From the street the Wave House in Venice looks as if it’s flowing toward the ocean, the swirling aluminum panels held in place by some invisible force. The structure is a departure from the traditional boxy bungalows that surround the property. Architectural designer Mario Romano grew up in Brentwood and lived for a number of years off the Venice Boardwalk, so he was intent on evoking the beach environment for his own home. Even the pivoting front door has a Venice reference point, calling to mind a skateboard deck. Behind the Gaudi-esque exterior, the 5,700-square-foot residence is otherwise modular, an angular U shape that embraces a rectangular pool. At one end lies the living room; at the other, a family room with a large kitchen/dining space in the center. All have glass walls that open onto the pool, which adjoins the outdoor screening room. Films are projected onto a concrete wall while heating units embedded in the ceiling keep movie watchers warm. Walking on water: the glass walls in the living room and along the dining room and kitchen area open onto the pool. The earth and sky are never far from sight, but Romano goes a step further in embracing the outdoors. The patterns that adorn the walls and floors are taken directly from nature: tortoiseshell geometrics, stripes on windswept sand, starlike bursts in deep space. “I’ve tapped into the intelligence of nature,” says Romano. “We always thought it was chaotic, but the new science—fractal geometry—shows that there’s a logic behind nature.” Romano uses CNC technology, in this case a customized machine set up inside the garage, to etch the designs onto sheets of Corian that function as the skin and soles of the house. The three-dimensional surfaces that emerge from the process invite touching, perhaps most daringly in a second-story bathroom, where 803 dots form a marine coral pattern that pops out of the wall. A “headband” of overlapping aluminum strips shades the second-story bedrooms while while also providing a ventilation system during the hotter months. Upstairs Romano indulges in some playfulness for his kids: a tepee in ten-year-old son Samson’s room, the canopy bed in eight-year-old Dasha’s. There’s a communal study area at the top of the stairs—the better for Mario and wife Anya, a screenwriter (Mother’s Day, Monster-in-Law), to supervise homework. Their own bedroom has a tree house feel, enhanced by the above-the-clouds effect of the white floor. 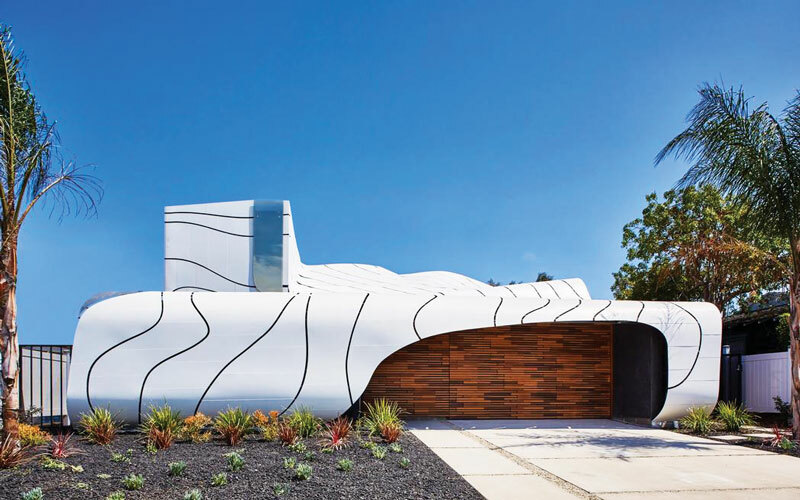 To provide shade and a ventilation system that cools the interior, Romano has lapped undulating strips of aluminum, much like a headband, around the top of the house. On a wall facing the pool, the layering extends to the ground, creating an impressionistic surface that changes in appearance as the sun moves across the sky: nonstop entertainment for anyone floating in the water. The TV room adjoins an outdoor home theater, where films are projected onto a concrete wall and heaters are embedded in the ceiling. Next article52 Great Saturdays in L.A.